What was your XAT 2018 overall and sectional percentile? Apart from XAT, which other entrances you appeared for and what were your percentiles? Quant – I faced major issues in quantitative ability and specifically in the number system, log, geometry, arithmetic. I realised the issue lay in my basic concepts and so I started the subjects one at a time. I studied from Vistamind classes, pre-recorded videos and Arihant MBA guide book. The key strategy was a consistent problem solving going from one difficulty level to the next. It is also important to return to questions that cannot be solved at the first or second try. I usually did those questions after one day, to check my understanding of the concept. Verbal – Apart from solving the basic grammar questions every day, I also took up reading books that I enjoyed. The strategy to ace this section is to increase reading speed and develop an understanding of grammatically correct usage of words. Reading books helps in this area a lot. One book per week is good enough target. However, along with books, solving at least 4 case-lets of grammar and at least 2 of reading comprehension is preferred. Logical/LRDI – I found this section very abstract without any specific concepts to study. However, one thing is important to ace this section is understanding the kind of case-lets that come in the paper. The strategy, therefore, is to learn various kinds of case- lets and that comes from practice only. My strategy was to solve at least 4 case-lets of LR and 4 case-lets of DI on a daily basis. Decision Making – This particular section deals with logical questions based on morality. The point in this section is to understand the question in the first attempt and then try to evaluate the options from the perspective of the question. There are always some inferences that need to be made from the questions before answering the question, the strategy is to gauge what the question is actually asking. One of the best methods I found was to solve a question, check the answer and then explain myself why my answer was wrong and why the given answer should be correct. This clears the concept about what I should focus on in a question. I took coaching from Vistamind, which later merged with Career Launcher. However, I believe that no amount of coaching can substitute self- study. It is important to internalize the concepts taught in class and the doubts asked in class. That said, I also believe that if you have an issue in any of the areas, it’s always preferable to ask for help than living with the problem by oneself. Therefore, according to me, a healthy mix of both coaching and self-study is the ideal method of preparation. Strategize on the basis of time you have, and the weakness you face, give it more time, however, keep practicing your strengths as well. When did you start preparing for XAT? 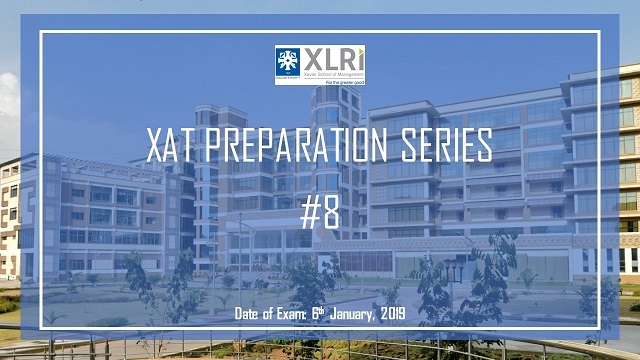 Please share in detail your month-wise preparation strategy for XAT in terms of 6 months, 3 months, 2 months, 1 month and last-minute strategy you followed. Method: Gradually increase the number of mocks every week. By this time, I was giving 3 mocks every week. It is important to give at 2 days in between each mock, so that you can analyse the result and improve the weak area. Since I was giving other entrances as well, this time is especially crucial. The strategy that I followed was to focus on the paper coming ahead. I segregated the calendar in terms of 2 weeks before each exam. I gave a maximum of 2 CAT specific mocks and majorly I analysed the previous mocks I had given. I solved the questions I had done wrong before, I kept solving sectional tests of my strong areas to keep myself in practice. Focus: Last minute strengthening of the strong areas and practicing question type specific problems. Method: Previously given Mock analysis together in terms of sections, for example, picking up unsolved/wrongly solved Quant section problems from all the mocks given. I started my last-minute prep for XAT after 17th December. Method: I solved 4-5 decision making sets, 5-6 Verbal and 4-6 quant sets from the unsolved/ wrongly solved questions, till the end of December. I wrote about 10-12 essays on the topics from the internet, and got them analysed by coaches, friends, parents. For GK and last-minute review, I had maintained a small diary which I used read through like a novel, it had GK points and quant formulas and LR tricks. This is the only thing I read through before the exam. I was dropping a year after under graduation, hence I did not face this particular issue; however, I faced the issue of monotony sometimes. I was doing the same task for hours at a stretch and it became boring sometimes. In such cases, I would take a break of 3-4 hours, watch a movie, play a game, go out with friends and refresh myself. The one thing helped a lot was talking about the difficulties I was facing. The more I talked about them, the less unbearable they became. Most of the time, I would get good insights on how to solve certain issues as a result of this communication. What was the one thing that you did consistently during your preparation? Or What do you think one should do consistently during the preparation of XAT? According to you, what is the most important aspect of preparation? The most important aspect of preparation according to me is PERSISTENCE with a HEALTHY MIND. It is imperative that at no point you should feel like giving up, the moment this happens you be able to revive the reasons you decided on giving the entrances in the first place. You should be mentally relaxed as well, because most problems occur as a result of a panicked mindset while taking a mock test. It should be given in the same manner as you would give your final exam. Another thing that is important is STICKING TO THE SCHEDULE. It is not 100% possible, but an attempt should be in that direction only. Following the schedule, at least 70%-80% of the time is fair enough. What are the best study materials for XAT or other exams? Please name some books, or other study materials (even newspaper/magazines) and online materials you had referred to during preparation. In terms of online or offline materials, which one did you prefer and why? For XAT specifically, I found a book by Nishit Sinha – LRDI very helpful. However, I majorly studied from the material provided by the coaching institute and the previous years’ exam papers available online. I preferred offline material more than online because it was easier to handle, however, mocks and sectional tests of CL helped a lot specially because the way they are formed. The interface for the tests is very easy to use. When did you start taking mock test and what was the frequency? How did you get it analysed and integrate it in your preparation? I began my mocks in August end and I started with 1 mock every two weeks and gradually increased it to 3 mocks every week. My schedule was not always fixed and I missed a few of the mocks I had planned, however, my consistency was at 80%, which according to me was fair. ANALYSIS OF MOCK- we had some mock test analysis sessions by the coaches. I individually analysed my mocks by bucketing the wrongly answered questions into the difficulty levels and the unanswered ones in terms of probable time taken to solve. I tried to identify any specific sub-topic, subsection that was consistent in the mistakes and went back to basic concepts and subsection tests to resolve and test the performance. Since the verbal section is also present in every exam, English becomes extremely important. My suggestion is to begin by reading English books, start from short stories in an easier language and then develop it further by reading authors that use more vocabulary. The focus should be increase comprehensive reading speed and to improve vocabulary. The grammar comes automatically with increased experience in reading the language. What was your exam day strategy in terms of question selection, time management, accuracy and sectional attempts/cut-offs? The exam day strategy begins with keeping calm and composed. Your mind should be relaxed before entering the exam hall. In terms of question selection and time management, I followed the strategy of dividing the time beforehand. Since XAT allows us to move between sections throughout the exam, it is important to use this to our advantage. I began my paper by solving my key strength areas first and then moved to the difficult parts. At the first reading, I solved every question I found simple and then began skimming through the rest of the questions again. I had decided beforehand to review my progress after every 45 mins, and to check the number of questions I remaining in the section. The idea was to maximise the questions in verbal and DM as those are my strengths and minimise guesses in the quant section. Preparing for XAT is a long and tiring process. How do you suggest one should keep his/her calm and confidence? Do not sit for a long stretch of time. Keep it maximum to 2 hours. Keep your hobbies balanced with preparation – take out time to listen to songs/ paint/ write. Spend time with yourself. Reflect on yourself and talk to oneself about the issues you are facing. Spend time with parents/ friends. It is imperative to talk about issues faced/ experiences you are going through with someone who can understand you. Discuss articles, books, movies with them. Maintain a journal if possible, it helps the reflection exercise, and improves the ability to express oneself. What is your message for XAT 2019 aspirants? The Mantra is to KEEP GOING even if the times are hard. Even if the mocks/ sectionals/ sub- topic tests aren’t going well, it is alright, these failures are just learning experiences and the focus should be on ANALYSIS and INTEGRATION of analysis. Persistence is the key to doing well, along with a NO EXPECTATION attitude. This is what worked for me. Always keep in mind that this is just an entrance exam, and life is much more beyond this, so do not take unnecessary mental tension.